Jane, The Quene: Third Consort of King Henry VIII by Dr. Pamela Gross is not one of the most accessible biographies of the elusive Jane Seymour. Most internet outlets list the biography as selling for more than two-hundred dollars. I obtained a copy through my state's centralized library union catalog and, as someone who has always been fascinated by Jane Seymour, I'm glad that I did. Dr. Gross's biography was the first of its kind published about Jane Seymour. As Dr. 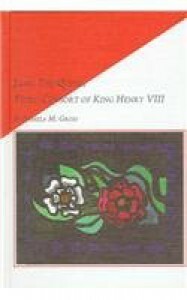 Gross notes, a number of works published about King Henry VIII's wives only include cursory information about his third wife, and much of it based on myth. Granted, little is actually known about Jane. Very few records remain offering any insight concerning her birth and childhood, her arrival at court, and her life with Henry VIII. This lack of information results in a short biographical sketch, less than two-hundred pages long. However, the information Dr. Gross was able to piece together results in an interesting image of a figure who has long been shrouded in mystery. The thesis Dr. Gross presents in Jane: The Quene is not that Jane Seymour was passive and submissive, submitting to the command of either Henry VIII or her family, but rather a clever, deceptively shrewd, and demanding woman. A woman who actively capitalizes on Anne Boylen's waning position in King Henry VIII's court. A woman clever enough to know not to push her luck with Henry VIII. And a woman who paid the ultimate price to be queen. I didn't feel that Dr. Gross's characterization of Jane was in any way demonizing or biased (in contrast to Agnes Strickland's grossly biased characterization of Jane in her biography of Anne Boylen), but is rather an indication of the quality of her research. In fact I think her characterization gives Jane more depth than the pious and meek figure that is recognizable today. While Dr. Gross presents a very well researched and informative biography, the editing detracts from the scholarly nature of the work. The spelling errors and incomplete sentences should have been corrected before publication. Furthermore, I felt that she used brackets excessively. The scholarly quality of Jane, The Quene, however, more than makes up for any editorial issues present. Anyone interested, as I was, in reading a scholarly account of Jane Seymour's life should consider making an attempt to locate this book at a library in their state (or buy it if you have an extra two-hundred dollars lying around). Dr. Pamela Gross was an associate professor of history at Adams State College (now Adams State University). She received her PhD from University at Buffalo, the State University of New York, where she specialized in Tudor-Stuart England.